I'd like to run uGFX on an STM32F429I-DISCO board using an external 1.8" TFT (ST7735). Unfortunately since I'm quite a newbe, I face already problems setting up my IDE. 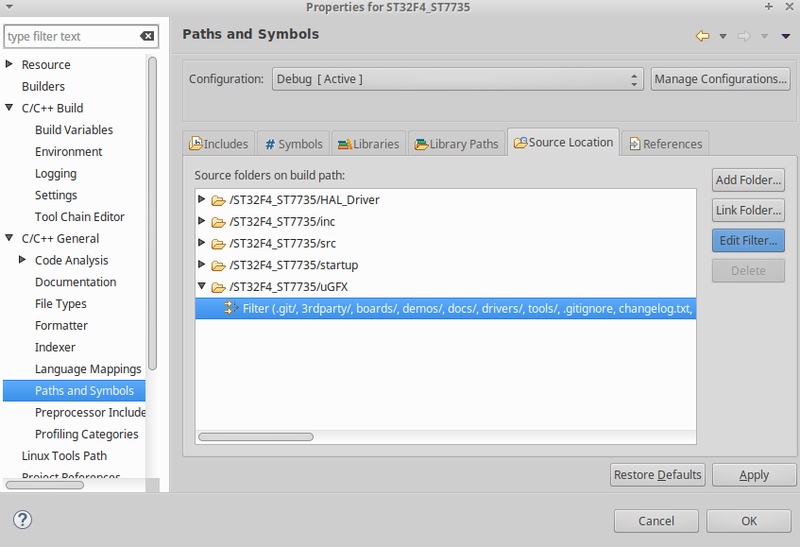 Since I'm using System Workbench for STM32 (version 2.3) I followed the instructions shown here https://wiki.ugfx.io/index.php/Using_Eclipse . Finally, I copied gfxconf.example.h to inc directory renamed it to gfxconf.h and configured GFX_USE_OS_RAW32 to TRUE. arm-none-eabi-gcc -mcpu=cortex-m4 -mthumb -mfloat-abi=hard -mfpu=fpv4-sp-d16 -DSTM32 -DSTM32F4 -DSTM32F429ZITx -DDEBUG -DSTM32F429xx -DUSE_HAL_DRIVER -I"/home/tombalabomba/embedded/Demo/ST32F4_ST7735/HAL_Driver/Inc/Legacy" -I"/home/tombalabomba/embedded/Demo/ST32F4_ST7735/inc" -I"/home/tombalabomba/embedded/Demo/ST32F4_ST7735/CMSIS/device" -I"/home/tombalabomba/embedded/Demo/ST32F4_ST7735/CMSIS/core" -I"/home/tombalabomba/embedded/Demo/ST32F4_ST7735/HAL_Driver/Inc" -O0 -g3 -Wall -fmessage-length=0 -ffunction-sections -c -MMD -MP -MF"src/main.d" -MT"src/main.o" -o "src/main.o" "../src/main.c"
That's quite odd since gfx.h has been added to the include path. Has anyone faced already a similar problem? Apart from my IDE issue I wonder if there exists a board template file for the ST7735 controller. Suprisingly, just for this controller there is no such a file located in the according drivers/gdisp directory. 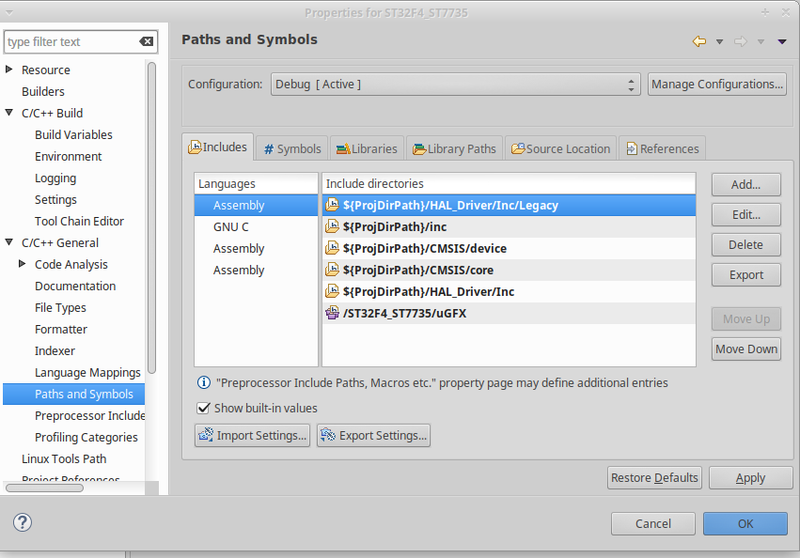 - In the includes did you add the uGFX directory to all languages or only to assembly? If you did add it only for assembly do it for all the other languages too. it's kinda embarrassing but it seems I forgot to add it to the other languages as well. Many thanks for this hint. This brings me directly to my second question. Since I couldn't find a board template file for the ST7735 controller, I struggle a bit to set up the board file. Do have a template available or is it similar to another controller? In case of the second I kindly ask you to give me a hint which one it is. It seems that there is no board file for the ST7735 which is strange. You should however be able to use the board file from the ST7565 and modify it for the ST7735. Just correctly rename the file and remove all the defines at the top. After that you can start implementing the functions for your platform. If the ST7565 driver is similar to the ST7735 and only a few modifications are required I guess it would be easier to do it that way. Hence, I kindly ask you to advice which modifications apart from changing "ST7567" to "ST7735" are required. Maybe @doc_rob can share the fixed driver? #warning "Dont forget to turn on PWM in mcuconf.h and in halconf.h"
// Send the command to invert all of the colors. It lookls like this is a quite good starting point.